Even if a site appears to load quickly in the browser, there may be items related to the site that take longer to fully load. If this is the case, you may resolve the issue by using the code wizard to make a custom delayed request. In the "Domain" field, enter the failed URL. Note: The code wizard allows you to preview PRO Feature requests, even if you are not upgraded. Select Refresh On-Demand and select and set Custom Flash Delay to 45s. Select all other attributes to match the type of request you would like to make. Custom Size, Quality, etc. 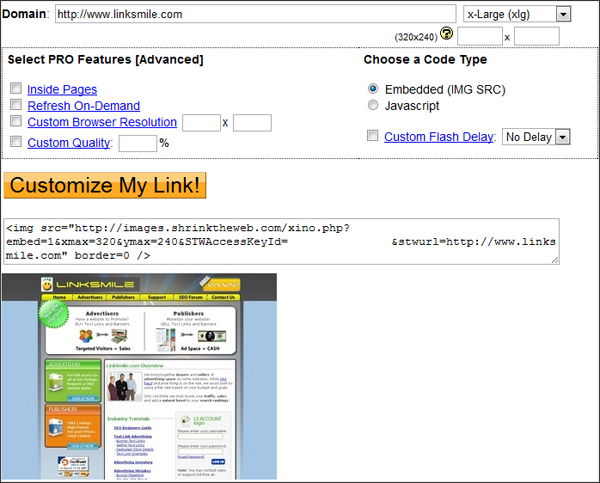 Click the "Customize My Link!" button. 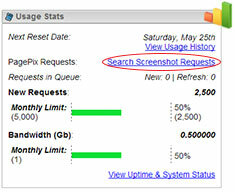 Find the Usage Stats box in your Dashboard and click the "Search Screenshot Requests" link. This launches Thumbnail History page and allows you to search for the specific url you requested. Select "Show requests by any user (not just those still linked to my account)." Note: Requests made in code wizard are shown as guest. If the image status is showing as "Refreshing" Click Go until the status shows "Requested." If the image capture continues to fail, open a support ticket for further assistance.